The importance of astrology was well understood by people of ancient history. Mappings of the stars, sun and moon and evidences of the use of astrology in daily life have been found in pre-historic cave drawings, ancient manuscripts, and Egyptian pyramids. The most recent, and possibly the most stunningly surprising discovery about astrology in history, involves the birth of Christ according to the Christian bible. It has been concluded that the star of Bethlehem was certainly an astrological event, consisting of numerous stars and astrological meanings. Scientists and astrologists believe that it was not just a bright star, that’s all. The wise men understood that the major event would take place in Judah based on the alignment of planets within the constellation of the Lion. In other words, the wise men used astrology phenomena and occurrences to perceive the event of the birth, not just the star. The importance of astrology can still be found in many cultures. The people of India and China put great emphasis in astrology even today. They practice the art of astrological readings in their daily lives, and base important decisions on this science. In the Western world, astrology has become more popular as a form of entertainment. Horoscope based on sun signs are published in most major newspapers and magazines across the United States. Horoscope mini-books and astrological calendar can be purchased in most supermarket checkout lanes. You can also find the so-called astrologers that charge $1.99 per minute to read your astrological reading over the phone. But majority of people do not realize that astrology in its truest form is actually of the utmost importance. Astrology is quite simply the study and understanding of the planets and stars and their influences on our daily lives. These influences can be quite real and accurate to some degree. Have you ever noticed that you have difficulty making decisions around the time of the new moon? The different phases and movements of the moon affect our minds and emotions much more than what people actually realize. This is only a minor part of the importance of astrology. Perhaps you have also noticed that your moods can change drastically during stretches of time that seem to have no pattern at all. A study of the planetary movements or alignments during those times might show and reveal that a pattern actually does exist. The position of the planets in your astrological chart at any given time can be viewed in correspondent to their position in your birth chart. These comparisons can highlight certain reasons for changes in mood and daily reactions to events. In short, the importance of astrology lies in the direct influence that the moon, sun, and stars play in our lives. Many people and different events affect our lives. And these people and events are affected by astrology as much as you are. When you realize how astrology affects others and yourself, you can start to use the knowledge of those influences to your benefit. When your astrological chart indicates that your emotions will be unstable for a few days, you can then put off important decisions until that time has passed. In reality, the importance of astrology is really the importance of your life. If we think for a while then we can easily understand that our lives are nothing than adjusting with different flows of time where we can never give up. The things help us in this struggle are our ability, knowledge, sense, outlook etc. A human being first must know himself before he attempts to know anything else. Knowing one’s self is the first step and the doorway to know other people and stuff. Perhaps the ancient wise men knew the importance of knowing one’s self or this self consciousness, and that is why they advised, “Know thyself.” If we can know well about ourselves, we can develop our positive qualities, simultaneously fixing up our negative tendencies. Life then will become a lot easier to deal with. We all have different characters, different aptitudes and different tastes. Our friends, relatives – all have their own, different personalities. Living the life means repeatedly and continuously interacting with the people around us in different ways. If we can know about our friends and relatives, we can easily deal with them with a good harmony and can avoid misunderstandings as well. Just from getting in to a joint venture business or selecting the life partner – there always is a vast importance to know the people you are going to deal with. From even our childhood, we have been seeing that time is a very important matter in our life. It has been said, “A stitch in time saves nine.” Because everything has a proper time to be done. There are proper times for sunrise and sunset. There are proper times to eat and sleep. There are proper times to go to school and office. Even there are proper times for prayers, too. If someone studies very hard whole year long but can not reach the examination centre in proper time then his whole labour will turn valueless. We also see practically that sometimes a work can be done so easily, with very less effort. Oppositely, sometimes we try thousand times but can not get it done. That is why it becomes clear that each part or duration of time has a ‘value’ of it. Each duration of time has it’s own nature and potentials. Such as, when it is a rainy season, it would often rain, and that is the visible nature of the time we call rainy season. This time controls the nature with it’s own values what we always see, but what we often fail to see that this time does control all of our lives in certain ways. Getting a good idea of the nature of time would surely be a very powerful way to live a better life from all the sides. Therefore, the role of astrology in our lives is immeasurable. Because it helps us understand ourselves, our friends and relatives. And it does tell us about the nature of time we pass through. That is why another name of Vedic Astrology or Jyotish is Hora Sastra, which means, The Science of Time. The word Hora came from the two words Aho (Day) and Ratr (Night). Thus Hora means the time, the phase of our existence in the eternity (Maha Kala). Truly and honestly, when we observe people’s lives around us, we feel it needed to acknowledge that life is not fair. I have repeatedly seen that complete innocent people suffer for no reason and people doing all sort of unfair and immoral activities enjoy all sort of happiness. Is this fair? I have seen one’s wife who has been proved to be most loving and faithful leaves him and his children for another man and how the husband destroys him little by little after that, and it is very difficult to believe such events even after they happen in life. It would be a lot more difficult to believe if it happens to you or to someone close to you. You will question yourself, “What did I do? Why this had to happen to me? Why this punishment?” You will often wonder if you are in an endless dream which is seeming to be real, because the reality would be too cruel to be believed. It will lead you to the condition where you will seriously start to doubt if there exists someone called God at all. Because if God is really there, how can he tolerate all these unfairness and punishes people for nothing? I have seen a few people getting religiously inclined for the pains life has given them, but they are very few in number. Most people lose all their potentials and destroy themselves little by little when they are continuously hurt over and over. Committing suicides and getting in to drugs are what we see, but we often fail to see the destruction going inside. Even before getting in to Jyotish I have dealt extensively with people’s lives, and that always led me to the impression that what in general we know and believe about life, destiny and God is not true, can never be true.. There are some serious incorrect information about the things we are taught from our boyhood, like pray to God he will listen to you, do good things and God will be kind towards you, etc. etc. Good deeds are not rewarded the way we expect nor bad deeds are punished right away. I have dealt with a large number of human lives and saw that most of the times the innocent people are the victims of the misfortune and problems. This world is full of unfairness and full of cruelty. This world is a very bad place and everyone is so selfish. All sort of unfair things are possible to happen in anyone’s life. In my life a few of the prayers were answered by the God but a lot more were unanswered same time, including the most intense and serious prayers and pleas to him that I submitted waking all nights with long and tiring worships. Surprisingly, all those subjects of prayers took a route of most miserable ends with the course of time. And observing all these, I always felt that there is some things, some truth, some facts about destiny and life-mechanism that we never know. There is a hidden system that works behind all these things happen to us. It responds to each and every act we perform, but it does not respond the way we expect, rather it has it’s own system and nature of responding to us. Only those who can knowingly or unknowingly tune up or adjust with this system are happy and others are unhappy, does not matter how innocent or how qualified they are. I know that many people would not agree to me and would call this world to be a beautiful place. I do not declare them to be wrong. Because, people believe what they experience. Some believe life to be fair because unfair things did not happen to them that much. And they are lucky that is why nothing wrong happened to them. I have always seen that being rich, happy or successful does not prove your qualification or innocence but it just proves your fortune. Because it has been my constant experience from people’s lives that without fortune one is not rewarded for his qualification nor for his goodness as a human being.. That is why when I think of one’s life, I see it as a person driving a car through a highway. Simply how good you drive, you can never assure that you would not be caught down with an accident because accidents do happen for others’ faults where we have nothing to do than just taking part in it or just being present in it. Similarly in life sometimes we do nothing wrong but for others’ mistake we fall the victim of condition and have to pay, and we find no ways to get out of these. Oppositely sometimes we get a lot more rewards than we actually deserve. All these confusions of me only found true and practically effective answers when I got in to Jyotish and started to realize how life works. Basically, Jyotish is the set of rules that operate our lives. God had to make a lot of rules when creating this universe. As an example he set the gravity for which anything falls in to the ground. The earth pulls us toward it, the sun pulls the earth and other planets toward it.. When we press our hand in to a wall, it gets obstructed by the wall and does not pass through it instead. When the temperature can be lowered then the water would turn in to ice… there are innumerable laws of up on which the creation is getting maintained. We are discovering and controlling these more and more with science. But actually there are a lot more ‘laws of nature’ that physics etc. cannot reach or explain. Those rules cannot be proved by scientific theories but only by observing lives they prove true. Those are the rules that operate our lives. And the set of those rules is called Jyotish. And in Hinduism it has been described the same, when Lord Brahma created this universe then he received the knowledge of the material creation from Lord Vishnu a part of which was Jyotish or Vedic Astrology. Vedic Astrology was not discovered or developed by people or scientists but just was received from the God, who created this universe and told us the rules of this universe. And if you study even a little of Jyotish you will see that it’s nature and structure is something like that what cannot be developed by human effort. When we realize this fact and also apply Jyotish theories to our lives then we see whatever is happening to our lives are happening as per the horoscopes of us i.e. the Jyotish. Then it answers all sort of questions and confusions I talked about. It answers that God is not unfair, nor he is cruel to make you suffer, but you are just experiencing everything according to the karma you have performed in your past births. It shows that God is not bothering to punish you but he has set a complete set of rules over your head and each of the events happens to you for you perform a particular action to make the event happen. It is like the echo, the sound you make, it reflects accordingly up on you. However this echo does not reflect as we generally expect it to do, such as work hard and you will be rich, study hard so that you do good in studies, and so on. Because we see that working hard cannot always make someone rich nor studying hard ensures a good grade in your exams. (As I said, most unfair things happen.) And so these things happen as per the karma or destiny you have been carrying from the previous births. In general they do not happen for what you are doing now, and the exception is performing remedial measure, when you know what sort of action is going to react in which way, and then you do accordingly. It is not engaging ‘worldly efforts’ to get something done that often fail, but it is about working with the mechanism and the core rules. Because you know the basic rules and know what sort of action will carry what sort of reaction from the nature, since you know the rules of creation. And when you start realizing this, you will see that trying with worldly efforts is like blind efforts, because that might be or might not be fruitful, (depending upon the horoscope, that shows the destiny most of the times.) but when you work as per the rule of nature or creation, you get it done. Thus an experienced astrologer who deeply watches lives would see that actually it is the planets making the person undertake different worldly efforts to solve his problems. It is the strength of evil planets verses the strength and placement of beneficent planets which would decide how and when the problem would be solved and also how easily. As I explained with the example of visiting the doctor concerning a health issue. Jyotish explains how the nature responds to each of your actions in a particular way, according to a set of rules. As I said, many of my serious prayers were not accepted and those subjects took a shape of miserable ends at last. There is nothing to blame God for not listening to me, nor to blame the people who acted to ‘materialize’ the events in this world, nor my prayer was insincere or anything. Because when I consult my horoscope, it clearly and prominently shows those areas of life worsening in the exact time periods when it happened in real. So actually it is not that the God did not listen to me, but the things just happened the way they were supposed to happen, and also in the exact time frame. Also, I see that the results of my successful prayers were also to happen as per my horoscope. So not my prayers granted them for me. So it all shows that prayers etc. is not going to affect the life but whatever is to happen would happen. By simple prayers and other good deeds we cannot get something done. But there are systematic keys to all these. As an example a password protected file in your PC would need the exact password to open it and does not matter whatever you do, it would not open. Even deleting the file itself is not the answer. Similarly in our life each and every problem needs a password, a specific action to be done to solve it. Otherwise whatever you do, it would not work because it just needs the correct answer, or step of action to get it accomplished. And a good knowledge in Jyotish or Vedic Astrology tells us a lot of passwords to open many files i.e., solve many of our problems. Otherwise even deleting the file itself, or a suicide is no solution. As per Hinduism, God has given us Jyotish to deal with the life, karma and destiny and this is just the set of rules controlling our lives. God knows them the best and not us. So we should follow his path. The manufacturers of your PC knows the best how to operate it and take care of it, you must follow their instructions to operate it. Jyotish answers such questions why people act so cruel to you sometimes. It shows us the divine miracle that each of us act in a very planned and controlled way to build the destiny as it was planned. You will surprisingly notice that whatever had to happen to you as per your horoscope is exactly happening, and to make them happen in the planned way, the people around you are behaving in a complete planned way! Your fate is composed by the activities of people related to or around you, and their action and reaction about you is just what is indicated in your chart. That is why when a ‘have been faithful wife’ leaves you being most unbelievably cruel and showing dramatic infidelity, you will actually see that both your horoscopes indicated something like that in that time! Thus whatever we do is planned and is used to make the destiny of us and people around us. In other words if you are killed then it is just your destiny to be killed and you need a person in your life who will kill you. And the person who will kill you carries a destiny to kill someone and he needs someone in his life to kill. So you play a role in his life by being his victim and he plays a role in your life by killing you. And these two events in your horoscopes are set to happen on the same day same time, and so you meet and the conditions runs to that stage to make it possible! It’s all about playing different roles in each other’s lives, and that is why in Hinduism it has been said that this Samsara (life in world) is actually a drama or role playing, we play roles in each others lives and learn our lessons this way. That is why we really do not do anything but we are made do all the things. So basically and truly, you really can not blame anyone for whatever they did to you, all you can blame is your destiny or fate! That is why we often say stuff like, “Even such a nice person like him did this to me, this is all my fate!” And this is very true. The agents of karma, the nine planets make people do all the things to you, as either reward or punishment. That is why even a most faithful wife can do most immoral act, but actually it is not her fault, but both your destiny say so through your horoscopes. That is why the sages and enlightened personages like the saints never blame anyone for anything, nor they hate anyone or get angry at anyone ever, because they all see it clearly that it is not our fault. And though many of us see it, but can not act as per it, being limited with maya and illusions, and the desire toward all happiness and joy etc. That is the difference between them and us. They practice non attachment while we attach ourselves more and more to this race of greed and meanness. That is why, how much cruel or unfair someone behaves to you, or the whole world behaves cruel to you – no point to blame them or there is even no benefit to do so. If your horoscope says being cheated then you can really not blame anyone and even dealing with most honest people will result being cheated, even he might not do it intentionally. So there is no benefit blaming anyone or doing anything unless you focus upon the central cause, or the central system administrating all these in a particular way. And that you can do only through Jyotish. When you will look at your horoscope you will be definitely seeing the problems were to happen, and then you will see the actual cause for this, i.e. the agents of karma who do all these, and then when you will put effort in the ‘real way’ i.e. performing Jyotish remedies, you will see how easily and surprisingly the problems get easier or sometimes even get completely wiped off. And it all will happen in a way that you will understand the changes started taking place after you did the remedies, i.e. the positive events happened for the remedies and if you did not perform them, they would not have been happened so. You will surprisingly observe how people’s reaction and behaviour to you changes surprisingly. For misfortune a most honest person can unintentionally end up cheating on you and for remedies you will rather see a most wicked sort of person is going fine with you. For remedies, you will see how easy everything becomes to you to handle. And then success and happiness will seem easy to you, and you will realize one ultimate truth that though a person works with qualification, he can not get his reward unless the nature responds to him. There is a saying that only losers and failures believe in fate. In practical I have seen it to be true to some degree. Because only an unsuccessful person who actually deserves to be successful sees and realizes how fate and destiny weighs him down all the times. Doing everything in the right way he can not get his goal and only then he realizes the truth. On the other hand the nature responds to each action of a successful person that is why it all seems to be easy to him and he ‘perceives’ that he is doing all these by his effort, but actually it is the nature to decide to who’s effort it will respond. That is why sorrow, pains, problems, difficulties can teach us so much true lessons and facts that happiness and joy can never do. And that is why sorrow, difficulties, pains are all ruled by the eighth house in astrology which also does rule the ultimate truth and also spirituality and loneliness. That is why most of the spiritual people have achieved the ultimate spiritual realizations through pains, grief, loneliness etc. This is just a mere example how facts around us are astrologically justified. Part 3 : Power of remedies : Interfering in to nature’s own mechanism and changing even the past ! The most amazing power of Jyotish and remedies is to change even the past, which is very much unbelievable. It is indeed unbelievable, but it always happens. When you perform remedies they often change your own past as a part of the blessings, and even in normal life we face this change of past what we often fail to see. As a practical example when a dasha (period) of a malefic planet starts, a person might feel sick and going to doctor, he might actually come to know that he has got cancer. However it is the result of some 30-35 years heavy smoking, and the doctor tells him that the cancer is some 4/5 years old from today. Now, the cancer he has been carrying since last 4/5 years, but he watched his past as healthy existence, but now he comes to know that what he has been knowing about his own past, is incorrect – so it is changing the past! Thus planets can even change the past and they do it very frequently while you do remedies; Of course they do it in a positive way. Another example. A student might have a very good MBA exam and expect a very good grade. Say to publish the result it took 4 months and in the meanwhile he ended his good dasha and started a bad dasha. Then in this bad dasha he will see that for some unexpected reasons, his result actually came out as simple B- grade where he was expecting a solid A. So the ‘Exam was good’ impression is no longer valid, i.e. past changed. Then he will have an impression to face difficulty in getting a good job with this B- grade. Now if he does remedy or say if a good dasha again starts then he will come to know that his B- grade would be enough for a good job, and he will somehow get a good job, that he would get with an A grade result, and then the past fear will turn invalid and the event of getting B- grade will be no longer significant. Thus again past changes. Most amazingly, there might be several basic changes to one’s past and status about the same subject! But, it needs a strong reversing dasha to change the past that does not happen so often, so we experience it less. But still, it happens. And remedy can change this past so easily and so efficiently. A man smokes for 20 years. He is healthy. But he starts a bad dasha, he has some health problems and goes sees his doctor. They found that he has got cancer. The doctor said smoking has a great deal to say about this. Now, he smokes for all last 20 years, and not just in this current bad dasha he is in when the cancer was found. But, he is experiencing the result in the bad dasha only. In good dasha he knew he was healthy, and experienced no health problems, and it was the truth and the fact to him that he was healthy. But now, a bad dasha lets him know that he has been carrying cancer for the last few years, and what he knew, i.e. he was healthy was wrong. So this bad dasha is totally denying the experience of his past letting him know that he was actually not healthy at all in the time when he was thinking himself to be healthy. Thus it changes his total impression and it changes what has been the fact to him until recently. This is changing the past. Now right at this point if he is able to do a very successful remedy then he will come to know from other doctors or further investigation that his cancer is not serious at all and can be cured easily. Now, with a tremendous strong remedy, he would come to know that he has got no cancer at all. The latter remedy is very much difficult to obtain because when planets do something to you then they generally make sure that you can not change it so easily. You love a girl. So you both expect and think that you would be happy in life. So you marry. But in a bad dasha you see some serious problem between you, and the previous impression and hope of being happy becomes invalid. Past changes. You might have a feeling that you would never be happy with her again. Then, if the marriage survives, again in a good dasha everything becomes so fine. So the problems you never thought to be gone away actually go away showing your impression wrong. There are constant minor changes to our past that we fail to see. But there can be major changes also, to the past. Since I explore human lives to a very deep extent, I always see how serious this ‘changing past’ might be. I am giving a true example, changed the background for the privacy keeping the basic facts same. A lady wears a stone without being sure of it’s effect and within some 10/12 days of wearing it, she faces some tremendously shocking reality in her life. She comes to know about a black chapter of her husband’s life about his another marriage before she (this native) was married to him. They have kids and have been living a happy life and her husband was a source of jealousy of her co-workers for the sort of loving, caring and ‘honest’ he always has been. Those happiness with an honest husband was promised in her chart with no sign of infidelity, esp. on that time it happened. But for wearing the gemstone it did so changing the past. Explanation : She wore a stone of her 8th lord, which is in the 2nd house. This 8th lord aspects her Venus, i.e. married life, spouse etc., and 8th is the house is immorality, cheating, dishonesty etc. So 8th lord aspecting Venus can do cheating from husband. But, a mere aspect is not enough for causing this, there are so many aspects in the chart. But as she wore the stone of the 8th lord, the 8th lord gained much power and then his mere aspect caused much trouble. Or, we can say that the 8th lord aspecting Venus caused cheating from husband, through a gemstone, i.e. the 2nd house, where the 8th lord is in! Most evidently, she has passed the whole Maha Dasha (MD) and two Antar Dashas (ADs) of her 8th lord after being married, nothing caused the cheating. But only within some 10/12 days of wearing the stone it happened. If the 8th lord normally caused it, then it must have been happened in the MD / AD of the 8th lord, or at least of Venus. But it did not happen so. On the other hand, when she was passing a very normal MD and AD, which had nothing to do with cheating, wearing the stone caused it within short. It did change the past for her. 1) Either her wearing of this gemstone was pre planned by the destiny as she did not had this in her horoscope, but her husband’s horoscope (very naturally) had indication of his multiple marriages and so it happened. In the above example the husband already had a true past which was revealed to his wife on wearing the stone so wearing stone was pre planned to match the true past of the husband. 2) It ‘truly’ changed her past, i.e. her husband did not have a previous marriage but when she wore the stone it created a different stream or flow of her life. It can be possible when in a person’s life named X, only X exists in real and all the people and material around him is fake so destiny can rebuild the fake world in reference to the action of X, only then it is possible. As per this second option, in above example the husband does not exist in real and since his life is only to affect his wife’s life (who is only true existing in her own world) then his life an be changed so many times as per the action of his wife, only who truly exists. This implication suggests that we all live in a world of illusion (maya) and in each of our life, only the self is true and rest is fake. If I am misunderstanding any of these verses, please bring it to my attention. I have also read in a site about Sri Chaitanya’s teaching, ‘Achinta bed abeda tatwa’ which implies, “Unbelievably, everything is same but different at the same time”. Do not you think that this ‘change of past’ fact is a clear expression of it? Well, whatever the fact might be, it is really too complicated and full of amazing divinity for us to understand. Because this is God’s mechanism to operate us! And only through the knowledge of Jyotish, one can reap the benefit of it. Importance of birth chart in Astrology It’s not easy to prepare an astrological data without a proper birth chart. A proper birth chart is the one of the essential parts of making a forecast or prediction. Countries too have birth charts, as they help in predicting certain successes or natural calamities. Thus a birth chart holds a prominent place in astrology, even though it varies in construction and application. An astrological birth chart is based on mathematical calculations and it’s mostly used for predictions and forecasts. An Indian Astrology birth chart of a person helps to know his birth details, that include time, date and place of birth. It also discloses more details on the position of the stars, planets, sun & moon during the time of birth, along with the ascending star, the sun sign & moon sign. The astrology birth chart used in Indian astrology or Vedic astrology is called ‘janam kundali’ .Through this you will get a diagrammatic representation of the position of the stars, planets, sun, and moon, that’s prepared after considering the time and place of birth . The predictions in Indian astrology are based on the person’s ‘janma rashi & ‘lagna’.. ‘Janma rashi’ is the constellation where the moon was situated during the time of birth. ‘Lagna’ indicates the rising /ascending sign of the person. Nowadays many of the Indian astrology sites provide free astrological (jyotish) readings. In astronomy, the zodiac is the ring of constellations that lines the ecliptic, which is the apparent path of the Sun across the sky over the course of the year. The Moon and planets also lie within the ecliptic, and so are also within the constellations of the zodiac. Inastrology, the zodiac denotes those signs which divide the ecliptic into twelve equal zones of celestial longitude. As such, the zodiac is a celestial coordinate system, more precisely an ecliptic coordinate system, taking the ecliptic as the origin of latitude, and the position of the sun at vernal equinox as the origin of longitude. It is known to have been in use by the Roman era, based on concepts inherited by Hellenistic astronomy from Babylonian astronomy of the Chaldean period (mid 1st millennium BC), which in turn derived from an earlier system of lists of stars along the ecliptic. The construction of the zodiac is described in Ptolemy‘s Almagest (2nd century AD). The term zodiac derives from Latin zōdiacus, in turn from the Greek ζωδιακός κύκλος (zōdiakos kuklos), meaning “circle of animals”, derived from ζώδιον (zōdion), the diminutive of ζῶον (zōon) “animal”. The name is motivated by the fact that many of the signs of the classical Greek zodiac are represented as animals (six out of twelve, plus two mythological hybrids). The Earth in its orbit around the Sun causes the Sun to appear on the celestial sphere moving over the ecliptic (red), which is tilted on the equator (blue). The division of the ecliptic into the zodiacal signs originates in Babylonian (“Chaldean“) astronomy during the first half of the 1st millennium BC, likely during Median/”Neo-Babylonian” times (7th century BC), continuing earlier (Bronze Age) systems of lists of stars. Babylonian astronomers at some point during the early 1st millennium BC divided the ecliptic into twelve equal zones of celestial longitude to create the first known celestial coordinate system: a coordinate system that boasts some advantages over modern systems (such as equatorial coordinate system or ecliptic coordinate system). The Babylonian calendar as it stood in the 7th century BC assigns each month a constellation, beginning with the position of the Sun at vernal equinox, which at the time was the Aries constellation (“Age of Aries“), for which reason the first astrological sign is still called “Aries” even after the vernal equinox has moved away from the Aries constellation. However, a scientific analysis of the location of the constellations suggest their determination in this region in the Bronze Age (~2700 BC), thereby suggesting an earlier establishment of the constellations. The Babylonian zodiac also finds reflection in the Hebrew Bible. The name of the twelve signs are equivalent to the names in use today, except that the name of the Eagle seems to have been usually substituted for Scorpio. The arrangement of the twelve tribes of Israel around the Tabernacle (Numbers 2) corresponded to the order of the Zodiac; and four of the tribes represented the middle signs of each quarter: Judah was the Lion, Reuben the Man, Ephraim the Bull, and Dan the Eagle. Thomas Mann in Joseph and His Brothers takes the Blessing of Jacob as attributing characteristics of a sign of the zodiac to each tribe. The faces of the cherubim, in both Ezekiel and Revelation, are the middle signs of the four quarters of the Zodiac: the Lion is Leo; the Bull is Taurus; the Man is Aquarius; and the Eagle is Scorpio. Hellenistic astrology was a syncretism of Babylonian and Egyptian astrology, and it was in Ptolemaic Egypt where horoscopic astrology first appeared. The Dendera zodiac, a relief dating to ca. 50 BC, is the first known depiction of the classical zodiac of twelve signs. Babylonia or Chaldea in the Hellenistic world came to be so identified with astrology that “Chaldean wisdom” became among Greeksand Romans the synonym of divination through the planets and stars. The Hindu zodiac is a direct loan of the Greek system, adopted during the period of intense Indo-Greek cultural contact during theSeleucid period (2nd to 1st centuries BC). In Hindu astrology, the individual signs are called ‘rāshi. The transmission of the zodiac system to Hindu astrology predated widespread awareness of the precession of the equinoxes, and the Hindu system ended up using a sidereal coordinate system, which resulted in the European and the Hindu zodiacs, even though sharing the same origin in Hellenistic astrology, gradually moving apart over two millennia that have passed since. The Sanskrit names of the signs are direct translations of the Greek names (dhanus meaning “bow” rather than “archer”, and kumbha meaning “water-pitcher” rather than “water-carrier”). Particularly important in the development of horoscopic astrology was the astrologer and astronomer Ptolemy, whose work, theTetrabiblos laid the basis of the Western astrological tradition. Under the Greeks and Ptolemy in particular, the planets, Houses, and signs of the zodiac were rationalized and their function set down in a way that has changed little to the present day. Ptolemy lived in the 2nd century AD, three centuries after the discovery of the precession of the equinoxes by Hipparchus around 130 BC, but he ignored the problem, apparently by dropping the concept of a fixed celestial sphere and adopting what is referred to as a tropical coordinate system instead. The High Middle Ages saw a revival of Greco-Roman magic, first in Kabbalism and later continued in Renaissance magic. This included magical uses of the zodiac, as found e.g. in the Sefer Raziel HaMalakh. The zodiacal signs remain in use as the basis of an ecliptic coordinate system, though modern astronomers tend to use an equatorial coordinate system since Early Modern times. One can see the use of the sidereal coordinate remained in use throughout the medieval period, e.g. in Hermannus Contractus in his de mensura astrolabii liber who gives the locations of stars in stereographic projection for the construction of an astrolabe, There he gives the zodiac coordinate of Antares as 14. Scorpius, equalling a J2000.0 ecliptic longitude of 224° (the 14th degree from the beginning of Scorpius at 210°). It is important to distinguish the zodiacal signs from the constellations associated with them, not only because of their drifting apart due to the precession of equinoxes but also because the physical constellations by nature of their varying shapes and forms take up varying widths of the ecliptic. Thus, Virgo takes up fully five times as much ecliptic longitude as Scorpius. The zodiacal signs, on the other hand, are an abstraction from the physical constellations designed to represent exactly one twelfth of the full circle each, or the longitude traversed by the Sun in about 30.4 days. There have always been a number of “parazodiacal” constellations which are also touched by the paths of the planets. The MUL.APINlists Orion, Perseus, Auriga and Andromeda. Furthermore, there are a number of constellations mythologically associated with the zodiacal ones: Piscis Austrinus, The Southern Fish, is attached to Aquarius. In classical maps it swallows the stream poured out of Aquarius’ pitcher, but perhaps it formerly just swam in it. Aquila, The Eagle, was possibly associated with the zodiac by virtue of its main star, Altair. Hydra in the Early Bronze Age marked the celestial equator and was associated with Leo, which is shown standing on the serpent on the Dendera zodiac. Corvus is the Crow or Raven mysteriously perched on the tail of Hydra.. The MUL.APIN glosses Hydra as “the Snake Ningizzida, lord of the Netherworld”. Ningizzida together with Dumuzi (Aries) and Pabilsag (Sagittarius) governed the household of the queen of the underworld. Taking the current constellation boundaries as defined in 1930 by the International Astronomical Union, the ecliptic itself passes through an additional thirteenth constellation, Ophiuchus, situated between Scorpius and Sagittarius. This is already recognized in Ptolemy‘sAlmagest. 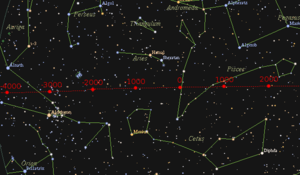 the astronomical constellation of the same name as the sign, with constellation boundaries as defined in 1930 by theInternational Astronomical Union. The theoretical beginning of Aries is the moment of vernal equinox, and all other dates shift accordingly. The precise Gregorian times and dates vary slightly from year to year as the Gregorian calendar shifts relative to the tropical year. These variations remain within less than two days’ difference in the recent past and the near future, vernal equinox in UTC always falling either on 20 or 21 of March in the period of 1797 to 2043, falling on 19 March in 1796 the last time and in 2044 the next. In the long term, if the Gregorian calendar isn’t reformed, the equinox will move to earlier dates: it will fall on 18 March for the first time in AD 4092. The zodiac system was developed in Babylonia, some 2,500 years ago, during the “Age of Aries“. At the time, the precession of the equinoxes was unknown, and the system made no allowance for it. Contemporary use of the coordinate system is presented with the choice of either interpreting the system as sidereal, with the signs fixed to the stellar background, or as tropical, with the signs fixed to the point of vernal equinox. Western astrology takes the tropical approach, while Hindu astrology takes the sidereal one. This results in the originally unified zodiacal coordinate system drifting apart gradually, with an angular velocity of about 1.4 degrees per century. For the tropical zodiac used in Western astronomy and astrology, this means that the tropical sign of Aries currently lies somewhere within the constellation Pisces (“Age of Pisces“). The choice of origin for the sidereal coordinate system is known as the ayanamsa, a Sanskrit word. It is not entirely clear how the Hellenistic astronomers responded to this phenomenon of precession once it had been discovered byHipparchus around 130 BC. Today, some read Ptolemy as dropping the concept of a fixed celestial sphere and adopting what is referred to as a tropical coordinate system instead: in other words, one fixed to the Earth’s seasonal cycle rather than the distant stars. Some modern Western astrologers, such as Cyril Fagan, have advocated abandoning the tropical system in favour of a sidereal one. The zodiac is a spherical celestial coordinate system. It designates the ecliptic as its fundamental plane and the position of the Sun atVernal equinox as its prime meridian. In astronomy, the zodiacal constellations are a convenient way of marking the ecliptic (the Sun’s path across the sky) and the path of the moon and planets along the ecliptic. Modern astronomy still uses tropical coordinates for predicting the positions the Sun, Moon, and planets, except longitude in the ecliptic coordinate system is numbered from 0° to 360°, not 0° to 30° within each sign. Longitude within individual signs was still being used as late as 1740 by Jacques Cassini in his Tables astronomiques.. Unlike the zodiac signs in astrology, which are all thirty degrees in length, the astronomical constellations vary widely in size. The boundaries of all the constellations in the sky were set by the International Astronomical Union (IAU) in 1930. This was essentially a mapping exercise to make the work of astronomers more efficient, and the boundaries of the constellations are not therefore in any meaningful sense an ‘equivalent’ to the zodiac signs. Along with the twelve original constellations, the boundaries of a thirteenth constellation, Ophiuchus (the serpent bearer), were set by astronomers within the bounds of the zodiac. Scaly Scorpions Are Good Water Fish. Taurus (Apr 20 – May 20) – is the fixed/earth sign. Taureans stubbornly cling to their own ideas and habits and may fail to take advantage of new ideas or situations, because they cannot see their practical use. They have to understand that while tenacity and a stable temperament yield reward in many endeavors, tolerance and flexibility are the best assets when it comes to personal relationships. Gemini (May 21 – Jun 20) – is the mutable/air sign. Using their communicative skills, Geminis adapt to any situation they encounter. However, they must learn to speak with candor instead of simply repeating what others want to hear. Geminis have clever tongues and develop an amazing ability to obscure the facts with stimulating and imaginative chatter. Cancer (Jun 21 – July 22)- is the cardinal/water sign. Cancerians get things done through the power of their emotional commitment. Not only do they aggressively work to accomplish the goals inspired by their own feelings, they also know how to appeal to the emotions of others. By making other people feel like family members, Cancerians effectively motivate others to get things done. They have to learn how to reach an emotional balance since they tend to be overly sensitive and moody. Leo (Jul 23 – Aug 22) – is the fixed/fire sign. Leos stubbornly cling to their pride. They do not readily alter their opinions or behavior at the request of others. Their stubborn nature makes it hard for them to accept that there is no virtue in giving what they want to give, rather virtue means giving what may be wanted or needed. Neither is there reward in giving misguided loyalty to those who are not worthy of it, which is another possibility with a Leo Sun sign. Virgo (Aug 23 -Sep 22) – is the mutable/earth sign. Virgos adapt to different people and situations by finding ways to make themselves useful. To hide their vulnerability, they focus attention on what they’re doing rather than who they are. To deflect attention away from themselves, Virgos will also focus on other people by praising their talents and virtues, or by criticizing faulty behavior or personal imperfection. Libra (Sep 23 – Oct 22) – is the cardinal/air sign. Librans accomplish things because they intellectually evaluate what needs to be done, then they charm others into cooperating to achieve the goal.. By unselfishly sharing the success of accomplishment with those who have assisted them, Librans nurture the cooperative efforts of others. They have to learn how to deal with confrontation. Their fear of hurting others and also of hostile situations can keep them from reaching their goals. Scorpio (Oct 23 – Nov 21) – is the fixed/water sign. Scorpios stubbornly cling to emotional attachments. They rarely forget or forgive emotional rejection. They have to learn that jealousy and possessiveness are self-defeating. Rechanneling negative feelings and experiences into constructive activity benefits others, as well as themselves. No other sign has the emotional strength of Scorpio. Sagittarius (Nov 22 – Dec 21) – is the mutable/fire sign. Restless energy and the need for personal independence keep a Sagittarian moving in many directions. They become experts at adapting to the culture or climate of their immediate environment. Always ready to travel for business or pleasure (and sometimes because of an overwhelming urge to escape) Sagittarians are all too willing to break free of the confinements of responsibility and work. Aquarius (Jan 20 – Feb 18) – is the fixed/air sign. Aquarians are born looking for ideologies to which they can stubbornly cling. They refuse to budge whenever an issue involves what they believe to be a matter of principle. As in the case of the Aquarian Abraham Lincoln, society greatly benefits when these principles are noble. Pisces (Feb 19 – Mar 20) – is the mutable/water sign. Pisceans adapt emotionally to their environment. Often painfully shy, they are adept at imitating the mannerisms of other people in order to hide their own personalities. A Piscean can too easily become a victim by identifying with the personality and problems of other people, because this severely restricts the development of their own personality and talent. The zodiac according to Indian Astrology comprises of 360 degrees. There are 27 Nakshatras or constellations in it.Therefore, the value of each constellation is 13 degrees and 20 minutes when measured from the fixed initial point. These 27 Nakshatras(stars) complete the entire circle of 360 degrees of the zodiac. A forecast based on the transit/ correlation/inter – relation of planets in relation to the Nakshatras is more accurate than the results predicted on the basis of any other system. What is your Nakshatra (star)? You can find it from the table given below. If you know the longitude of the Moon at the time of your birth in your natal chart calculated according to the Indian/ Vedic system, go to the 3rd column and go down till it lies between the two values given in the row above and below. Your Nakshatra or star would be the one given in the 2nd column the one at the start of range of longitude of your Moon. Each Nakshatra or star that comes under Indian Astrology has an astronomical name associated with it and which is referred to by the Western Astrologers and Astronomers. Table with Astronomical name equivalent of Indian Nakshatras. Samudrika Shastra is hand analysis in the Vedic tradition, a Sanskrit term that translates roughly as “knowledge of body features.” This tradition assumes that every natural or acquired bodily mark encodes its owner’s psychology and destiny. Elevation, depression, elongation, diminution, and other marks become relevant. Traditional stories in India thus abound with descriptions of rare auspicious markings found on the bodies of memorable people. Legends about the Rama and Krishna Avataras, Gautama the Buddha, andMahavira the Tirthankara conform to this tradition. Indeed, Hindus, Buddhists, and Jains share this ancient Samudrika Shastra tradition. Fragments of it pop up in other cultures as well. Phrenology and face reading evoke its principles. Modern body groupings such asectomorph, endomorph, and mesomorph also mimic the ancient Samudrika Shastra’s impulse. Samudrik shastra which is the study of body features seek its main interest in ‘hast samudrikam’ which is the study of palm lines. Although palmistry is studied and practised in various parts of world but it is nowhere so accurate and scientific as it is in the ancient Hindu literature. There is a similarity between western and Indian palmistry and it owes to the fact that in past(13th century AD to 19th century) palmistry has travelled from India to all the world. The science of ancient Indian palmistry is very scarce today and its knowers pass this knowledge only to the trusted students by training them under their guidance as opposed to the western way of divulging knowledge by books. This system is known as ‘guru-shishya parampara’. Unfortunately the knowers and practitioners of ancient Indian palmistry are very scarce today and only a hybrid generation of both western and Indian palmistry exists and is most visible even in India. It much owes to the guarded secrets of ‘hast samudrikam’[palmistry] by its scarce knowers. As the question of accuracy stands in front of us , I would like to clarify that correct prediction of some event and timing of that event makes the accuracy and this is the most important part of Indian palmistry. The ancient esoteric and calculative methods of palm readings give details of accuracy not only about the future of native but also about the present and past(for example native’s date and time of birth)and there is a very very important feature of Indian palmistry that is that it gives the accurate prediction of native’s family’s( blood relatives i.e. parents, siblings and spouse) past present and future also. Above are few of the features that I have listed in short which make Indian palmistry a distinct and outstanding path of astrology( Yes , Indian palmistry is very much part of Indian astrology). Indian palmistry is one the several marvels that ancient vedic civilisation has given to us and it is also perfect in its purpose like all other branches of vedas. The position of the thumb shows us the subject’s current strength of will. We look to see how far away from the rest of the hand the thumb is held, making special note of cases where it has fallen inside the hand, or is held rigid at a 90 degree angle. Any time the thumb has fallen inside the hand, the individual’s will has been broken. Their words and actions are not their own, but have been imposed upon them by another. At these times the subject must be handled gently, for they are likely to react to outside stimuli with anger or open hostility. If you find your own thumb showing a broken will, review your recent thoughts and actions to see where you have “given up”. These patterns in ourselves can be difficult to spot at first, because we are acting in exactly the “correct” way in which we have been programmed. In cases where the thumb is spread to its maximum angle and held so firm that it quivers, the subject has completely lost control of their temper, and will strike out violently at anything they feel stands in their way. As long as the thumb holds this position, no amount of reason or negotiation will have any effect on them. Many personality traits are revealed by the spacing between the fingers. Look at the spread between someone’s middle and ring fingers. This distance can be up to an inch and a half at the fingertips, or the fingers can be held so tightly together that they overlap. The wider this space is, the more generous the person, and the more willing they are to part with their money. A narrow space shows a more frugal person who knows the value of the dollar. When the fingers touch, their attitude is almost miserly. In Hand Analysis, one hand is seen as stationary, and one is the moving hand. In most cases, the dominant hand will move frequently while the other remains at rest. First look to the spacing on the stationary hand. This is your reference to the individual’s basic attitudes towards money. Now look to the moving hand and compare the two. See which hand has a larger spread between the middle and ring fingers. Since the moving hand reflects the current situation, a wider space here would show that the subject is presently feeling more generous, and is more willing to part with their money. When the space is narrower on the moving hand, they are not likely to spend on anything except necessities. Our fingernails reflect the defenses we maintain against the outside world. When a nail breaks (or is filed down, bitten, cut, or torn off by a rampaging gazelle – it doesn’t matter which) it indicates a breaking down of some of these protections. The area of life is affected is shown by which nail breaks, while the severity of the break identifies how serious the issue actually is. Remember that the stationary hand shows long-term issues (often relating to family), while the moving hand indicates current situations. The index finger reflects the ambitions, Ego, leadership, and power. A broken fingernail here is a sure sign of problems at work.On the moving hand it shows a new or temporary difficulty, while on the stationary hand it tells of a reoccurrence of an ongoing issue. If your own index fingernail is broken, realize that something has penetrated your defenses and harmed your ego. Identify the cause.This is crucial in order to prevent future reoccurrences. Once you know the source, remedy the situation by adjusting your own thoughts and ideas. You have contributed to your own misfortune, and only you can correct it. By altering your thoughts, you will change both your actions and your emotions, effectively negating the harm which has been done to your ego. The middle finger reflects the powers of the mind, and the Super-Ego.. A broken fingernail here is a sure sign of some guilt or mental stress, usually caused by monetary problems. On the moving hand (the dominant hand) it shows a new or temporary difficulty, while on the stationary hand it tells of a reoccurrence of an ongoing issue. If your own middle fingernail is broken, realize that something has penetrated your defenses and harmed your Super-Ego. Identify the cause. What has affected your feelings of self-worth?. Once you know the source, remedy the situation by adjusting your own thoughts and ideas. Determine how you have contributed to your own situation and you will avoid future reoccurrences. By altering your thoughts, you will change both your actions and your emotions, effectively negating the harm which has been done to your sense of Self-Worth. The ring finger reflects the emotions, and the Personna (the “mask” we wear). A broken fingernail here is a sure sign of emotional distress, and is caused by fear of failure, loneliness, or self-doubt. On the moving hand (the dominant hand) it shows a new or temporary difficulty, while on the stationary hand it tells of a reoccurrence of an ongoing issue. If your own ring fingernail is broken, realize that something has penetrated your defenses and harmed you emotionally. Identify the cause. What has caused your feelings of loneliness, isolation, and fear?. Once you know the source, remedy the situation by adjusting your own thoughts and ideas. Determine how you have contributed to your own situation and you will avoid future reoccurrences. By altering your thoughts, you will change both your actions and your emotions, effectively negating the emotional trauma you have just experienced. The baby finger reflects the communications, spirituality, and the Id (or Libido). A broken fingernail here tells of an inability to communicate on some level. (This can be verbal, non-verbal, or even sexual communications.) On the moving hand (the dominant hand) it shows a new or temporary difficulty, while on the stationary hand it tells of a reoccurrence of an ongoing issue. If your own baby fingernail is broken, realize that something has penetrated your defenses and hampered your ability to communicate with others. Identify the cause. What did you need to say that you couldn’t? Who did you need to say it to? Once you know the cause, remedy the situation by adjusting your own thoughts and ideas. Determine how you have contributed to your own situation by not speaking your mind, and you will avoid future reoccurrences. By altering your thoughts, you will change both your actions and your emotions, effectively breaking through the communication barriers. The thumb reflects our willpower and control. A broken thumbnail reveals that the individual’s will is being dominated by another. Remember that on the moving hand (the dominant hand) it shows a new or temporary difficulty, while on the stationary hand it tells of a reoccurrence of an ongoing issue. If your own thumbnail is broken, realize that something has penetrated your defenses and is breaking your will, and is also causing you to doubt your own abilities to control the situation. Identify the cause. What (or who) is causing you to “give up” and sacrifice your own desires? You will know by the helpless or hopeless feelings associated with it. Once you know the cause, remedy the situation by adjusting your own thoughts and ideas. Determine how you have contributed to your own situation with your self-doubts, and you will avoid future reoccurrences. By altering your thoughts, you will change both your actions and your emotions, and you will find the inner strength to once again stand up for yourself. Some individuals will succumb to the temptation of petty theft quite easily. Given the opportunity, they will quickly pilfer unattended money or products. Further, they are able to justify their actions to themselves and become convinced that they have done nothing wrong. In most other respects they are decent citizens or employees, with good records and prospects. Their cunning often allows them to continue the thefts for many years. This is the most common type of embezzler. If both traits are present, all that is needed to create the embezzler is opportunity. Everyone is very quick to judge you and blame you for their problems. You are misunderstood, and no one really knows you. Nobody notices all your positive traits. You have been betrayed many times in the past. You know your life would improve if everyone else would just quit causing so many problems. You try hide it, but your life is an emotional roller-coaster. The traits revealed by the bent baby finger (and the bent finger itself) can be corrected with proper massage techniques performed on the hands. Rheumatoid Arthritis and Osteoarthritis are indicated on the hands by the enlargment of the first (topmost) knuckle on the fingers. The knuckle will begin to enlarge long before there are other physical symptoms of arthritis. The knuckle will begin to enlarge once the subject’s lifestyle makes them predisposed to developing the corresponding arthritic condition, but long before the ailment has become debilitating. This is the best time for treatment. Blessed Herbs has medicinal quality preparations for a number of specific health conditions. The second knuckle of the thumb reveals how the subject uses or suppresses their anger and temper. This knuckle can have a very pronounced enlargement, or can be completely smooth without any noticeable “bump”. The larger the size of the knuckle, the more volitile the temper. When the knuckle runs smooth without any noticeable enlargement, this reveals that the anger does a “slow burn”. Slow to build, this type of temper pattern will grow gradually over a period of years before finally exploding. Once the anger is released, it is quite venomous and non-physical. The subject will resort to whatever they feel is necessary to “even the score”, using non-direct methods such as poison or vehicular assault to obtain their revenge. If the knuckle is very enlarged, the opposite is indicated. The temper is physical, direct, quick to build, quick to blow, and just as quickly the anger is released. Due to the potential for extreme violence, these subjects have learned how to suppress their strong anger, and turn it inwards upon themselves. The result of withholding this rage is their common feelings of depression and isolation. If either of these conditions is shown on your hands, you need to learn how to express your negative emotions before they become a problem. Learn how to speak up when something begins to bother you, instead of holding back in an attempt to preserve the status quo (which will be disrupted anyway). Your long-term happiness depends upon your ability to begin expressing your anger, frustration, and rage in a more productive way. There are many support groups and counselling services which can help you with this – find the one that is right for you. Expression, not Suppression, is the key. When making decisions, it is common to think one course of action is correct, while feeling that another would be more appropriate. This battle between the head and heart goes on within each of us. Fortunately it is easy to tell which one is more likely to develop a “blind spot” – we merely look to the thumb. The tip section of the thumb governs the intuition or “Gut Instinct”. The second phalanx (middle section) shows the development of the logical mind. Compare the two sections to see which is crossed by deep horizontal lines, or “Blocks”. In most cases, one phalanx will have two or three distinct blocks, while the other remains relatively clear. The phalanx which contains these blocks reflects the aspect in which one is likely to develop a blind spot, missing some important detail. If the middle section on your thumb has several horizontal lines, your logic often cannot be trusted. Whenever there is a conflict between what you think and what you feel, your intuition is the more accurate. If the first phalanx shows these blocks, the reverse is true – trust your logic. You can also look to see if several vertical lines cross one of the phalanges, which indicates that the “blind spot” has been overcome. If your own fingernails reveal a spinal curvature, Chiropractic alignment or Tai Chi can be very effective methods of treatment. (As a certified Tai Chi instructor, I’ve seen dramatic results in students.) Toning the stomach muscles is also very important. Imbalances in the Glands can be identified from lines upon the fingertips. Strong diagonal lines or the “Grille” formation found on any fingertip reveals a glandular problem. The deeper the lines, the more severe the condition. In cases where the grille formation is found on all fingertips, the most common causes are Menopause, or an adverse reaction to pharmaceutical birth control (The Pill). Herbal treatments are usually effective, as long as they are of medicinal quality such as fromBlessed Herbs. The Human brain is greatly affected by the position of the body. One well known example of this is the expression of the mouth. Smiling actually lowers the blood tempature of the brain, while frowning will increase it. Just as facial expressions will affect brain function, so does the position of the hands. When meditating, it is especially important to hold the hands in a position which facilitates that particular form of meditation. This will help the mind to maintain its focus while eliminating distracting thoughts. The first meditation steadies the body and trains the mind. This technique is called by many names: Grounding, First Chakra, Root Chakra, “Void” Meditation, Earth Connection, Chu (The Pillar), and Zen “One Point” Meditation are the more common terms. All of these are methods of eliminating adverse stress and developing one’s inner power. While the breath control will be different for each of these, the hand position is the same..
Place the palms together with the fingertips upward. Extend the thumbs the same way. Lift your hands and hold them in front of your chest. Feel the heat between your hands and take note of the pulse in the palms. Now direct your attention to the point where your index fingertips touch. This is the “One Point”. You will begin to feel your pulse at the fingertips. Within seconds you will notice your calmness and inner power growing. Do not try to keep other thoughts out of the mind. Allow these to enter and leave your mind naturally. You will begin to notice a brief time period BETWEEN these thoughts. This interval of “Void” is the purpose of the Zen “One Point” Meditation. Personally, I also enjoy “moving meditations” such as Tai Chi. You can find some of these at InternalKungFu.ca. The flexibility of the 1st knuckle of the thumb reveals how adaptable a person is to new situations and environments. In some cases the thumb is so flexible that it bends back beyond a 90 degree angle. This extreme flexibility is most visible when holding a pen for writing. The greater the flexibility of the knuckle, the more adaptable the person is. In cases where the thumb will bend far back on itself, the individual will quickly and easily adjust to any new environment in which they find themself. They will not stop to first consider whether the change is beneficial or harmful – their love of new experiences is stronger than their good judgement. This class of person will quickly outperform their peers, regardless of the morality of their actions. For this reason, owners of extremely flexible thumbs must exercise caution in choosing their friends. If associated with a group of philanthropists, they will improve more lives than their peers. If with a group of voluptuaries, they will exceed all others in their debauch. The study of moles is called Moleosophy. The location of a mole, its size, shape and colour can be interpreted as indicators of your character, as well as generalities for the future. Twin moles could have yet another connotation. Moleosophy, when co-related with interpretations of other psychic sciences, substantiates personality and character readings, and provides a complete view of the subject. When there are twin moles irrespective of their location, the person possesses a dual nature. The presence of two moles, side by side, is indicative of a person being in love with two people. Mole Size Mole Color Place Based on the size, colour and place where it is situated,the characteristic of a person can be determined. one point: slow and steady get high position. one point : If a point is seen then your life will be slow and steady and at later part of Life you get high position. small round type : You will face problems, difficulties in life. medium size : You want to live a comfortable life, but sometimes you are lazy. Hard work required. Shade moles : You will not lose nor gain from anything. Wheat moles : You are brisk but you will face difficulty at first and later everything will be smooth.Red color moles : You will have patience and most of them will be in teaching profession. Yellow moles : You are talented in writing, poet and music. Moles on Fore head : You will lead a good life, achieve Fame, Financial freedom and success in politics. Moles on Below forehead : You have aim, confidence and will succeed above 40 years. Moles on Eyebrow : You have to work hard, some will get job, no jealous. Moles on Tip of Nose : Some will lack discipline. Moles on Chin : You will achieve in politics. You will gain assests. Moles on Tongue : you will have good education, Knowledge, planning and some will be a scholar. Moles on Arms : You are polite, hardworking and lead a happy married life. Moles on Elbow : You will struggle in life to achieve your goals and some will a young widower. Moles on Armpit(left):You will face great struggle in early part of life and well rewarded later. Moles on Neck : Sometimes you are unlucky and others make you fool. Moles on Front : You will get unexpected good fortune. Moles on Back : You will be working and others get name. Moles on Chest : You will have no peace of mind and some will struggle in life. Moles on Right : Your laziness will affect family life, you will enjoy to travel, and love comfort and luxury. Moles on Left : You are active, energetic and get what you want in life. Moles on Buttocks : You are unambitious, recoinciled to any mode of life. Moles on Thigh : you work hard and mostly people do business at later stage. Moles on Foot : You lead a pure life and interested in social service. You achieve name, fame. Do exercise daily to stay healthy. Moles on Leg : You will get assests, comforts through wife. Moles on Eye :You are honest, reliable. Moles on Heel : You make enemy easily and are prone losing friends. Moles on Hip : You are satisfied, resilent and spirited.